For some added aventure to your vacation, try snorkeling or diving some of the most exciting coral reefs and shipwrecks of Bermuda. Not only is the diving great here, but it is also perfect for those who want to learn how to dive and experience diving in 25 feet of water in the same day! Here you will find yourself surrounded by schools of rainbow colored fish and beautiful coral reefs with adventure hiding behind every turn. The best diving months are from May to October when the sea is calm and the water temperature is warm. 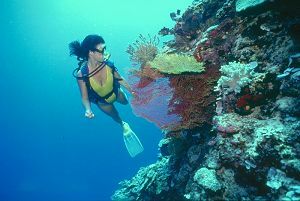 You can usually find scuba schools that are open daily and all dives are supervised by licensed instructors. Also, night dives and certification is alvalible for the heavily interested traveler. Blue Water Divers Co. Ltd. The Constellation, an adventure through a 200-foot schooner that was on it's way to Venezuela in 1943. It now lies 30 feet under water off the northwestern side of the island. Tarpon Hole, is located near Elbow beach. Here you can explore the coral reefs including, yellow pencil, elkhorn, fire, and star coral. Water clarity to 150 feet, the world's northernmost coral reefs teeming with life and ocean floor littered with hundreds of wrecks from the 15th to the 20th Century make Bermuda one of the finest, most fascinating Scuba Diving destinations in the world.